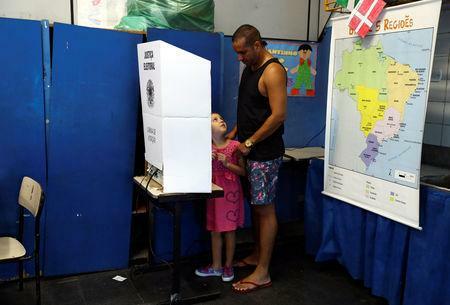 BRASILIA (Reuters) - Brazilians began voting on Sunday in the most polarized election in decades as anger over corruption and crime were expected to carry Jair Bolsonaro to the presidency, marking a dramatic swing to the right in the world's fourth-largest democracy. Bolsonaro's sudden rise was propelled by rejection of the leftist Workers Party (PT) that ran Brazil for 13 of the last 15 years and was ousted two years ago in the midst of the country's worst recession and biggest-ever political graft scandal. His leftist rival Fernando Haddad, standing in for the jailed PT founder and former Brazilian president Luiz Inacio Lula da Silva, has been trailing Bolsonaro since the first-round vote three weeks ago. "There was a lot of corruption, bad things, so much stealing. There's got to be a change," said the 74-year-old resident of the capital Brasilia. The last round of opinion surveys on Saturday showed Haddad narrowing a wide polling gap. Endorsements from leading legal figures in Brazil's unprecedented fight against political corruption also raised hopes among Haddad's supporters that he can pull off what would be a stunning upset win. Haddad has reduced Bolsonaro's lead from 12 to 8 percentage points in five days, according to the Ibope polling firm that gave him 46 percent of voter support compared with Bolsonaro's 54 percent. A Datafolha poll also released late Saturday showed Bolsonaro had 55 percent and Haddad 45 percent. Haddad told reporters in Sao Paulo early Sunday that the opinion polls represent an important swing in momentum in his favor. "I am confident that we will have a big result today," he said. "Let's fight until the last minute. 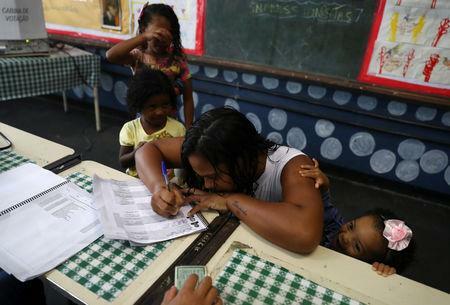 Polling stations opened at 8 a.m. (1100 GMT) and the last will close in far western Brazil at 7 p.m. Brasilia time. Bolsonaro voted in a military district in Rio de Janeiro, greeted by supporters shouting "legend" and "president." "The expectation today is the same as I saw in the streets: victory," Bolsonaro said, briefly addressing reporters. While Haddad has gained traction in the polls, he failed to win the key endorsement of center-left former candidate Ciro Gomes, a former governor of Ceará state in the northeast, which would have given him a big lift in Brazil's poorest region. He did win the backing of Rodrigo Janot, Brazil's former prosecutor general under whose watch unprecedented corruption prosecutions took place. He tweeted on Saturday that he would vote for Haddad. Popular anti-corruption judge, Joaquim Barbosa, who jailed several top PT leaders for corruption, also came out for Haddad. The endorsements were a blow to Bolsonaro's campaign to position himself as the anti-corruption candidate. The 63-year-old seven-term congressman has vowed to crack down on crime in Brazil's cities and farm belt by granting police more autonomy to shoot at armed criminals. He also wants to let more Brazilians buy weapons to fight crime - a major demand by one of his biggest backers, the powerful farm lobby. University student Daniel Castro Correa de Souza, who voted for Gomes in the first round, opted for Haddad on Sunday in an effort to stop Bolsonaro. "Bolsonaro represents a rupture in democracy, a threat to democracy, because he has authoritarian thoughts. 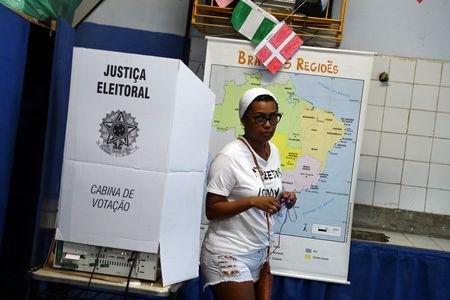 I can't agree with that," said 21-year-old Souza, after casting his vote in Brasilia.